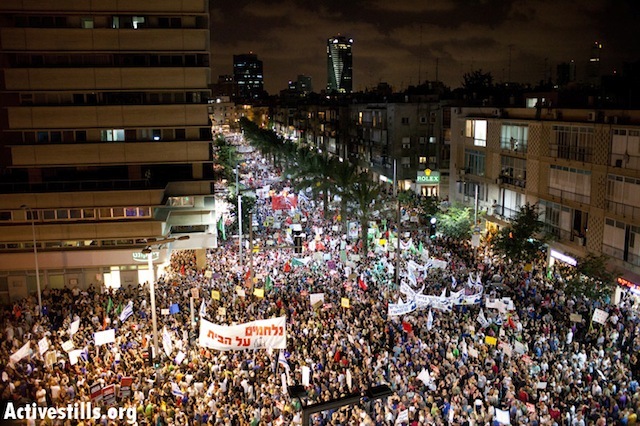 More than 300,000 people took part in demonstrations across Israel on Saturday night calling for “social justice,” a blanket term covering demands for reforms in housing, taxes, healthcare, childcare, and education. Forty-five thousand Verizon Communications Inc. workers from Massachusetts to Washington, D.C., went on strike Sunday after negotiations fizzled over a new labor contract for more than a fifth of the company’s work force. Tens of thousands of opponents of embattled Yemeni President Ali Abdullah Saleh held rallies across the country following prayers on Friday. Thousands of protestors largely drawn from Pakistan Justice Party staged a sit-in protest in front of country’s Parliament in Islamabad on Saturday evening to protest corruption, unemployment and US drone strikes. Israeli forces targeted three separate rallies across the West Bank on Friday, firing tear gas at participants and lightly injuring dozens. In Jordan, dozens of activists staged a sit-in following Ramadan evening prayers on Friday night in front of Salt city’s cultural center, protesting what they concidered government stalling in impementing nesessery political and economic reforms. Thousands of demonstrators angry about the government’s austerity program briefly reoccupied a central Madrid plaza on Saturday after police withdrew following widespread outrage at officers’ handling of a protest two days earlier. Nepalese riot police arrested teachers affiliated with temporary teacher struggle committee during a sit-in protest in front of the education ministry in Kathmandu on Thursday. It’s wonderful to hear about the good things happening. Thank you for this.